Krishna Adhikari was 18 years old when the Maoists took him away from his home in Phujel of Gorkha district on 4 June 2004. 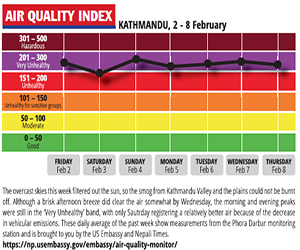 His body was later found in Chitwan. Krishna’s parents, Nanda Prasad Adhikari and Ganga Maya, went to the National Human Rights Commission, civil rights activist groups, the police, and district administration to lodge a complaint. No one listened to them. So, out of desperation and with nothing left to lose, Nanda Prasad and Ganga Maya came to Kathmandu in January this year and staged a hunger strike outside Prime Minister Babu Ram Bhattarai’s official residence in Baluwatar. The police picked them up and dragged them to the Kamal Pokhari Station, where they were illegally detained for 48 days. Later, they were handcuffed and taken back to Gorkha in a jeep and dumped there even though the Maoists had evicted them from their home. 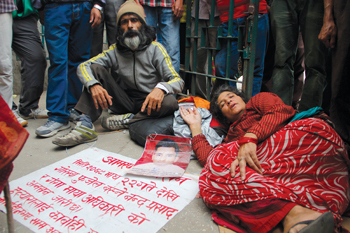 Now, Ganga Maya is sick, and the couple are back on the pavement outside Kathmandu’s Bir Hospital, again in a hunger strike protesting the lack of police action against their son's killers . It doesn’t look like the Adhikaris will get either justice or treatment. Passers-by crowd around them, but their plight is drowned in a capital with so much misery. “We went to Baluwatar because no one listened to us,” says the bearded Nanda Prasad, “we though at least the prime minister from Gorkha would. But they locked us up. Now we are back because my wife needs treatment.” The Adhikaris want to lodge a complaint with the police naming the Maoist cadre who they say are behind their son’s murder: Januka Poudel, Chhabilal Poudel, Kali Prasad Adhikari, Baburam Adhikari, Ram Prasad Adhikari, Shiva Prasad Adhikari. Among them, Januka Poudel is now personal asssistant to Baburam Bhattarai’s wife, Hisila Yami. After their son’s murder, the Ahdikaris were threatened by the Maoists and were told their other son would also be killed if they didn’t withdraw their FIR application. Their second son also disappeared after being taken in by Kamal Pokhari Police in January. Then in January 2008, the Maoists killed all their livestock and chased them out of their homestead in Phujel. Kamal Pokhari Police station chief Dipak Bhandari said they were removed because they were obstructing traffic outside the prime minister’s residence, but had no answer to why they were locked up. He said they were sent to Gorkha on instruction of the district administration. The CDO of Gorkha, Krishna Karki said the couple refused to take the Rs 1 million compensation for families of conflict victims, and insisted that they wanted the murderers prosecuted. “But it is not possible to file a case because all conflict-related cases like these were scrapped in 2008 by the Pushpa Kamal Dahal-led government,” Karki said. "I have no time for depression"
At the end of his first month in Sundarijal, BP is trying to keep his spirits up through the worst of the winter. "The government is answerable to whoever formed it." Excerpts from an interview with Minister for Women and Social Welfare Gore Bahadur Khapangi in Nepal Samacharpatra, 20 October.